[Published by] Akinola's Music (ASCAP) / Enoch Level 7 Productions (ASCAP) / I Wrote This Music (ASCAP) / Speckulative Music (ASCAP). Mastered at Mirror Image. 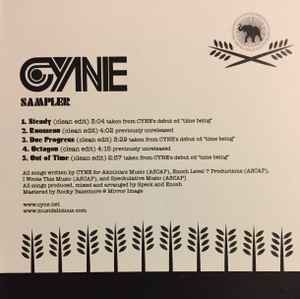 Tracks 1, 3 and 5 taken from Cyne's debut CD "Time Being". Tracks 2 and 4 are noted as being previously unreleased. Released in a regular sized jewel case with a front insert only, no back inlay was issued.